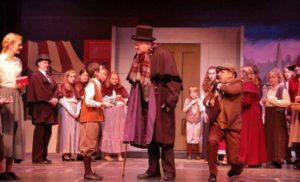 The Un-Common Theatre Company begins our 32nd season with A Christmas Carol, a fun and lively musical adaptation of Dickens’ classic novella. 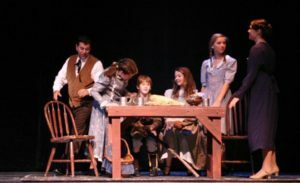 This production, our fourth collaboration with Bay Colony Productions, will be performed at the Orpheum Theatre in Foxboro on December 2-4 and December 9-11. Charles Dickens’ classic gets the full Broadway treatment by the Broadway team of Alan Menken (Beauty and the Beast, Little Mermaid), Lynn Ahrens (Ragtime, Seussical) and Mike Okrent (Crazy For You, Me and My Girl). A story we all know and love set to music overflowing with Holiday feelings to carry in our hearts all year long. 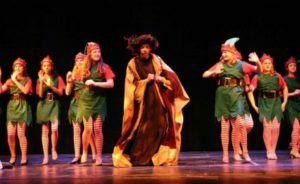 Called by The New York Times “a tonic for adults, and for children a transfixing journey, “this spectacular musical extravaganza is filled with the magic of the holiday season, exuberant dances, flying ghosts and the sights and sounds of Dickensian London. A Christmas Carol retains its emotional power and pure joy, thanks to the marvelously-told story by Ockrent and Ahrens, and the Menken/Ahrens score filled with beautiful melodies and emotional lyrics. 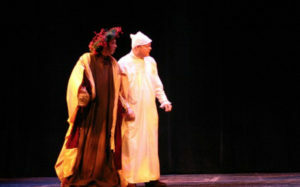 A Christmas Carol is presented through arrangement with Music Theatre International (MTI).